L - Mature size 16" x 31"
9" x 7" blue green centered nicely rounded and corrugated foliage with 17 vein pairs and great substance. 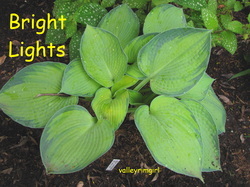 1/2" wide vivid white margined leaves. Off white flowers on 24" scapes. 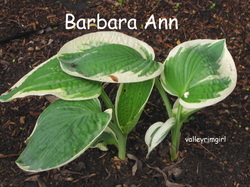 Discovered in an 'Elegans' tissue culture batch in England by two lab technicians named Barbara and Ann. L - Mature size 21" x 31"
11" x 10" rounded and lightly corrugated leaves start out a brilliant light yellow changing to a bright greenish yellow by fall. It has 12-13 vein pairs. Near white flowers. This September picture really shows the veining on each leaf. G - Mature size 32" x 72"
16" x 13" heavy textured, deeply veined but not puckered, deep blue-grey heart shaped leaves with 16 vein pairs. Vase shaped as the petioles stand upright with leaves held horizontally and then cascade downward, giving it a tropical look. 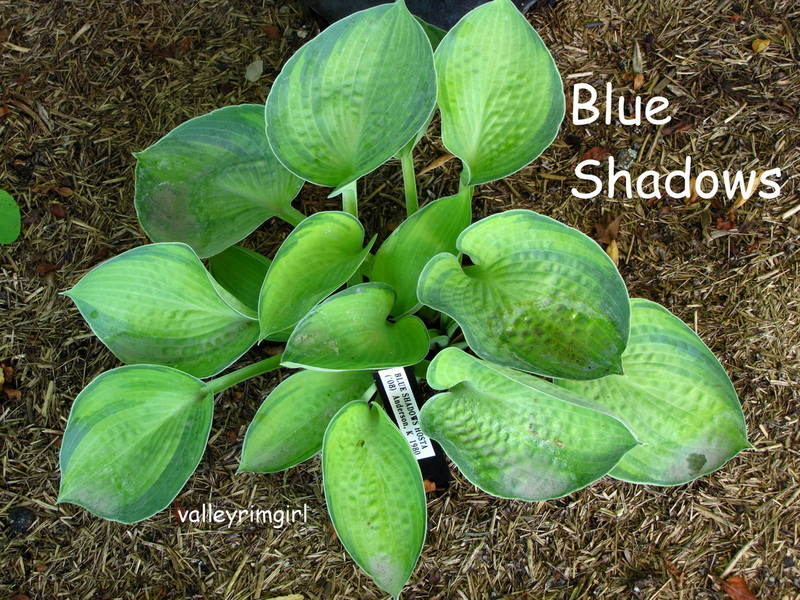 One of the largest of the blue hostas and one of the best blooming hostas. Slow grower. Pale lavender to white glossy long lasting flowers on 48" scapes with a dense flowering habit. Needs 50 - 90 % shade. 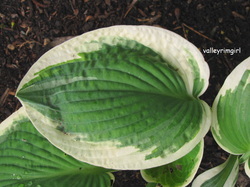 Awards: Eunice Fisher Distinguished Merit Award 1991; Lucille Simpers Award for the best large or giant blue leaf hosta 1990, 1997 & 1998; Best Green Hosta in a Garden Award 1991; Best Blue Leaf Award 1994; Best Blue Hosta in a Garden Award 2000, 2001, and 2004; Benedict Garden Performance Honorable Mention Award 2012. This picture was taken in mid Sept 2011 of my 3 year old Blue Angel. 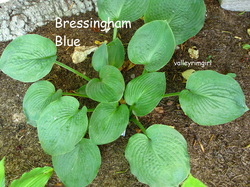 S - Mature size 6" x 11"
3" x 2" round deeply cupped extremely thick blue-green leaves with 8 - 9 veins. Pale lavender flowers. Flowers are hyacinth-like on short stems - very striking. Awards: Best Blue Leaf 2004, Benedict Garden Performance Award of Merit 2008, Hosta of the Year for 2008, Benedict Garden Performance Medal 2011. 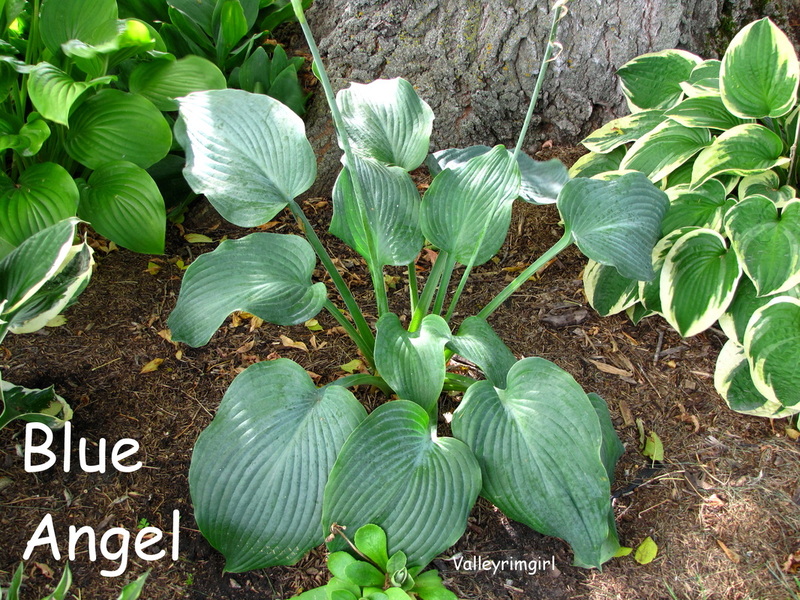 This cute little hosta is in many places in my yard, I love it so much! 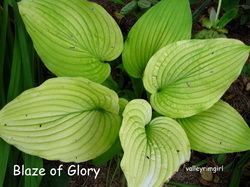 M - Mature size 16" x 40"
7" x 6" extremely thick cupped, puckered, rounded leaves with irregular blue-green margins and gold centers. 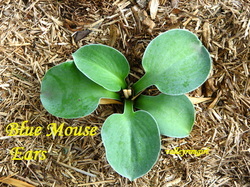 Near white flowers on short 15" spikes. 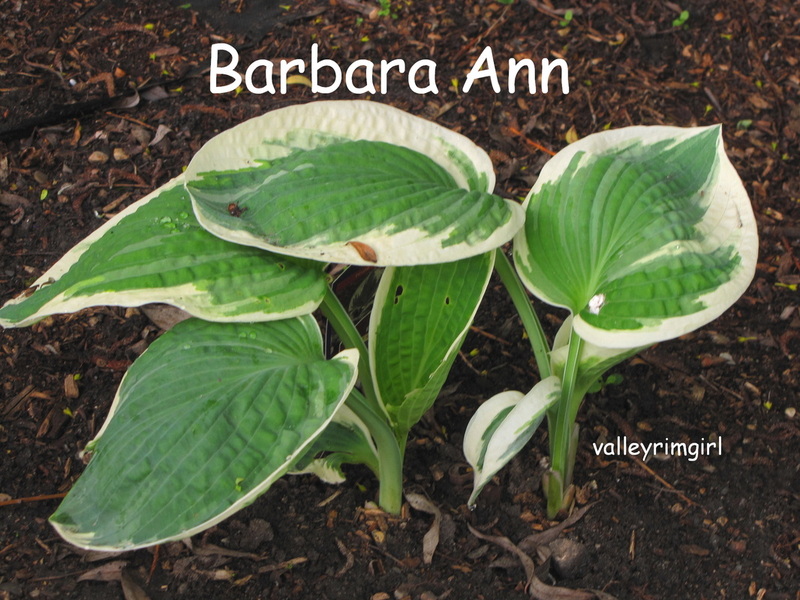 13 vein pairs on leaves. 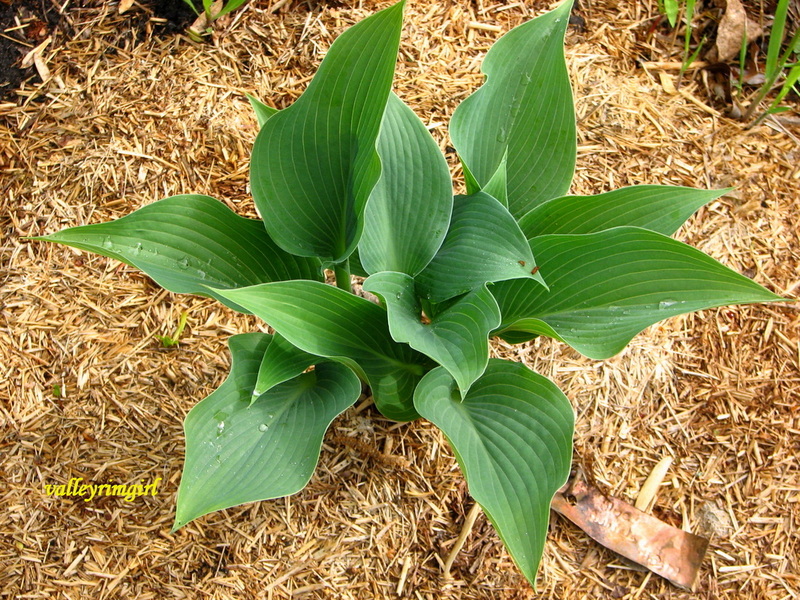 Very slow growing hosta. 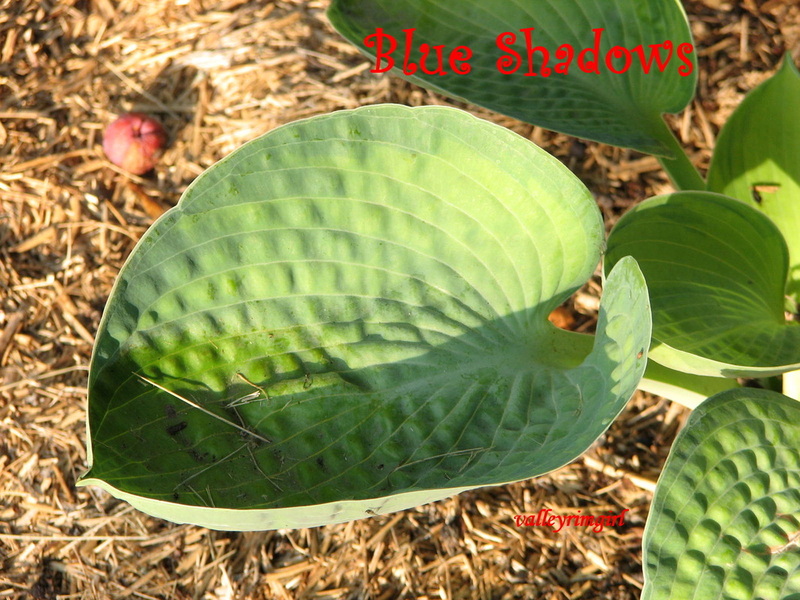 L - Mature size 24" x 52"
9" x 5" silvery blue-green, ovate, cupped rugose leaves. The foliage mound grows very symmetrically in layers. White flowers. This picture was taken on June 10, 2009 when it was just opening up. 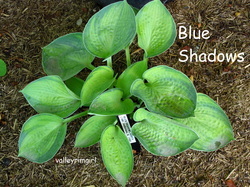 G - Mature size 28" x 68"
15" x 12" finely ribbed, rounded blue-green cupped puckered leaves. Near white flowers on 36" scapes. Fairly thick leaves. Loves moisture. 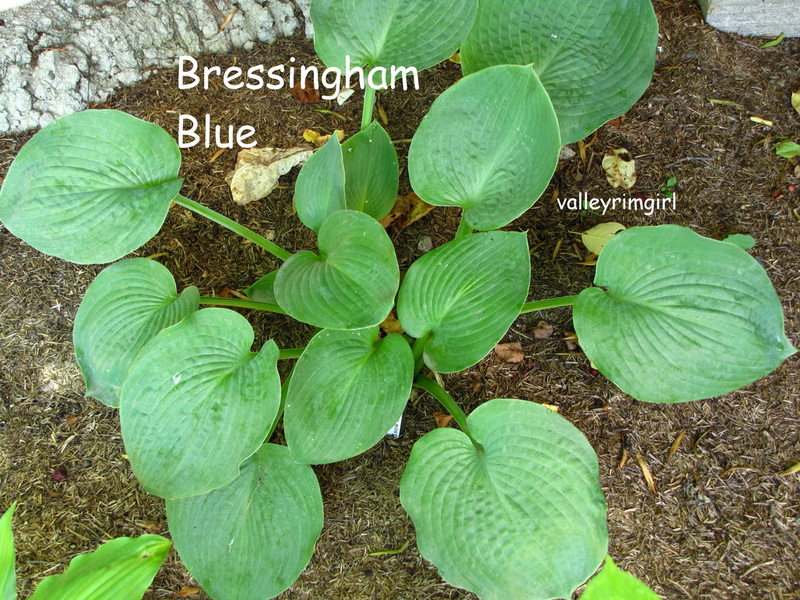 My Bressingham Blue is planted near the edge of the valley and may not ever get to the mature size as the bush is next to it. 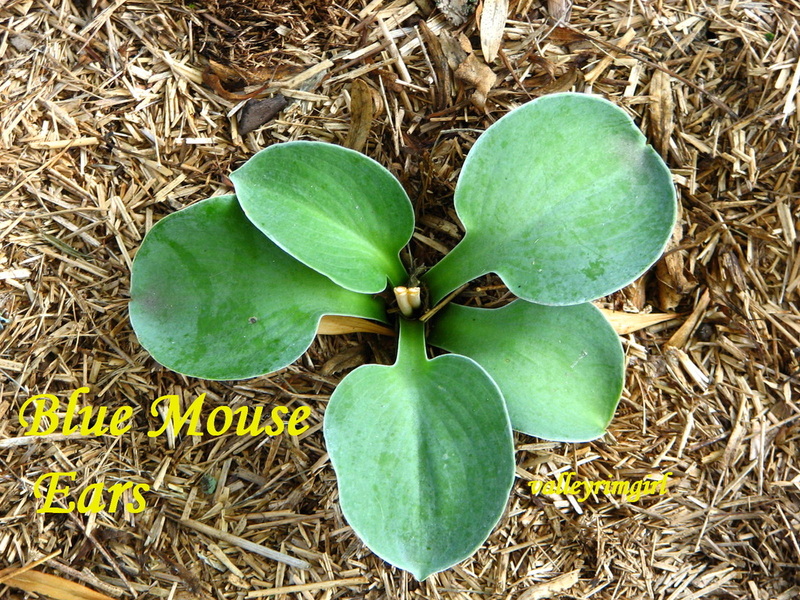 I bought this plant in 2008 and this picture is taken in mid summer 2011. SML - Mature size 19" x 52"
7" x 6" gold centered, blue green margined leaves with 15-16 vein pairs. Irregular margins are .75 - 1.5" wide. 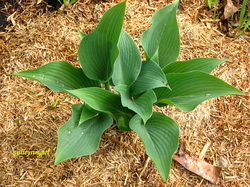 Leaves are thick substanced, moderately corrugated, broadly oblong-ovate shaped and covered with a thin underside bloom. Near white 2" x 1" wide flowers on 20" scapes.